These “Next Generation” poly oil drains offer an array of features and benefits not found on most other drains. This unique, user-friendly feature is incorporated on all Crew-Chief Self-Evacuating oil drains. Auto-Check eliminates the need for manual ball valves to seal the drain before air evacuation. The pressure valve located at the bottom of the down tube automatically closes with air pressure. Emptying the drain has never been cleaner, easier or more automatic. 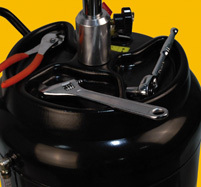 A molded poly tool tray is mounted on top of the tank for easy access to ratchets, wrenches, pliers and other oil change service tools. The easy-to-read sight gauge gives a quick look at the fluid level in the drain to prevent overfilling. 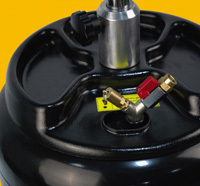 Four 4" swivel casters make this drain easy to move and position under a vehicle. 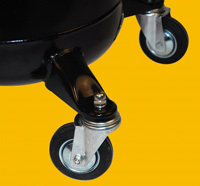 Plus the casters are made of an oil and chemical resistant material that gives them an extended service life. 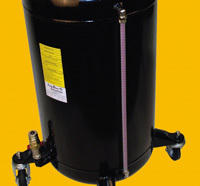 For added safety, this pressure relief valve prevents the tank from over-pressurizing. Once the optimum evacuation pressure is reached in the tank, the safety valve will relieve any excess pressure. 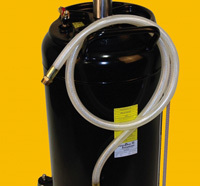 The 6' evacuation hose is designed to stay connected to the used oil storage tank. With the quick disconnect feature, the drain can be quickly and securely connected for fast and clean evacuation.